This is a common question. Is it because dogs are lacking something in their diet? Are they trying to make themselves vomit? Are they sick? Or is there another reason? Dogs are not known for being fussy eaters. At least with my dog, if I put something semi-edible in his path, he'll gobble it up – food scraps, garbage and goose pooh ... or grass. 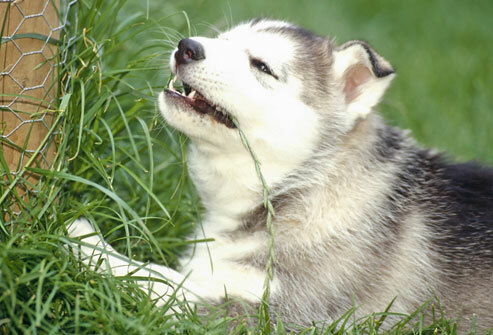 There have been many theories offered about why canines like to eat grass. Since dogs are descended from wolves and foxes, when they hunted for food they ate the entire “kill.” They wound up eating a lot of plants and berries because much of their prey was herbivores (plant-eating animals). Interestingly, carnivores tend to go for the stomach and its contents first, so it's likely that dogs may eat grass because they like it and it was once part of their normal diet. Then there is the great unknown: Do dogs eat grass to make themselves vomit? Or do they vomit because they eat the grass? Most veterinarians believe that dogs eat grass simply because they like it, and vomiting naturally follows. The grass acts as an irritant and causes them to vomit. They may or may not actually use grass as a medicine when they have an upset stomach. Some veterinarians believe that dogs eat grass because their prepared diets are lacking in greens. And as some support of this contention, dogs sometimes seek out a particular variety of grass to nibble. No matter what the reason, your dog's "grass" habit is normal behavior and most veterinarians believe you need not be concerned about it. A note of caution: Take care that your pet does not eat grass that has been treated with fertilizer, pesticides or herbicides. This could cause stomach upset or even worse problems for your dog.